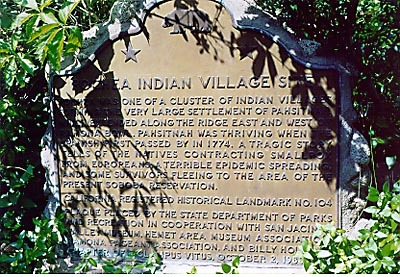 Pochea was one of a cluster of Indian villages forming the very large settlement of Pahsitnah, which extended along the ridge east and west of Ramona Bowl. Pahsitnah was thriving when the Spanish first passed by in 1774. A tragic story tells of the natives contracting Smallpox from Europeans, a terrible epidemic spreading, and some survivors fleeing to the area of the present Soboba Reservation. Ramona Bowl, 27400 S Girard St, Hemet; plaque located near restrooms. Return to other landmarks in Riverside county.